January 2016, the Illinois Supreme Court announced mandatory e-filing of civil cases in circuit courts by January 1, 2018. In an effort to be proactive rather than reactive, the Champaign County Circuit Clerk’s office has been live with permissive eFiling since April 2017, and has been fully integrated with our court case management system, JANO Justice Systems, since August 2017. 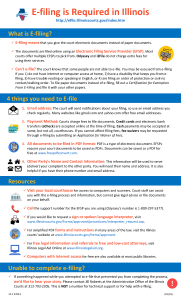 At the bottom of this page, you will find how-to documents, as well as the Illinois Supreme Court eFiling Waiver, for those who are unable to eFile. This is the latest version of the accepted standards and practices for for electronic filing in the Champaign County. This form may be used by a filer who is representing him or herself. The form allows the filer to ask the judge to file on paper. Instructions prepared by the Illinois Supreme Court on how to prepare a PDF filing. Instructions prepared by the Illinois Supreme Court on how to Register to E-File. Instructions prepared by the Illinois Supreme Court on how to sign in to E-File. Instructions prepared by the Illinois Supreme Court on how to create a new password for Odyssey. Instructions prepared by the Illinois Supreme Court on how to add a payment account. Instructions prepared by the Illinois Supreme Court on entering your case information. Instructions prepared by the Illinois Supreme Court on how to enter the party information. Instructions prepared by the Illinois Supreme Court on how to upload your documents. Instructions prepared by the Illinois Supreme Court on how to pay filing fees. Instructions prepared by the Champaign County Circuit Clerk to help litigants file a new civil case in Champaign County. Instructions prepared by the Champaign County Circuit Clerk to help litigants file into an already existing civil case in Champaign County. eFiling refers to the delivery method of court documents. Rather than mailing or hand carrying filings to the courthouse, you may now send them electronically!